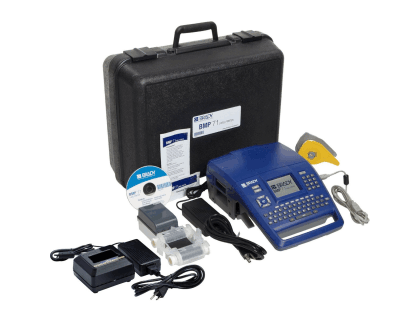 Learn about the Brady BMP®71-QC 115160 Label Printer with Quick Charger. Includes pricing, features, and frequently asked questions. The Brady BMP71-QC 115160 Label Printer is a label printer that enables businesses to print up to 1,000 labels at a time. The Brady BMP71-QC is able to print in 300 DPI on more than 30 different types of material. Quick charge the printer in approximately one hour. Large, graphical, full color display with indicators. Built-in wizards for easy label creation. Wide variety of label materials. US D635183, 8333524, 8328442, 7999836, 7893951, 6929415, 5951177, 5918989. Pros: Portable, easy to use, fast printing, QWERTY keypad. Cons: No built-in cutter, only 200 MB memory capacity. Bottomline: A versatile printer that allows you to take care of your printing needs throughout your business. The Brady BMP71-QC 115160 Label Printer with Quick Charger retails for $954.99. The BMP71-QC Printer is our most versatile labeler for on-the-job printing. It prints on over 1000 label parts, and has a convenient handle and rechargeable battery. Desktop and portable sign and label printer for creating multi-line signs and labels to identify wires, circuit boards and other industrial itnems. Versatile labeler prints on more than 1,000 label parts, and has a convenient carrying handle. Easily import and export generated label files, lists and graphics to the printer through USB 2.0 port and a USB flash drive. Compatible with M71 Series label tape cartridges, fits BMP61, TLS 2200 and HandiMark cartridges with included roll adapter. Raised panel labels (engraved plate alternative). Some BMP61 labels with adapter (TLS and BMP61 ribbons not compatible). For use with the battery for the BMP71 Printer from Brady. Charges battery in one hour. (1) Roll of M71-31-423 White Die Cut Labels. (1) M71-R6000 Black Ribbon Cartridge. What type of materials can the BMP71-QC Label Printer print on? The BMP71-QC Label Printer prints on 45 types of premium label materials, including PermaSleeve wire markers, indoor/outdoor vinyl, and polyester die-cut labels. Does the Brady BMP71-QC 115160 Label Printer with Quick Charger have a built-in cutter? No, the Brady BMP71-QC does not have a built-in cutter. Do you need a computer to run the Brady BMP71-QC 115160 Label Printer, or is it a self-running machine? The Brady BMP71-QC Label Printer can be used as a stand-alone printer or connected to your PC. Where can I buy the Brady BMP71-QC 115160 Label Printer with Quick Charger? You can buy the Brady BMP71-QC Label Printer with Quick Charger by clicking on the link above, or from sites like Megadepot and Amazon. What are some Brady BMP71-QC 115160 Label Printer with Quick Charger alternatives? Brady BBP33 Label Printer Kit for Slide Labels. Brady BMP21-PLUS Portable Label Printer. Brady BMP21-LAB Portable Label Printer.